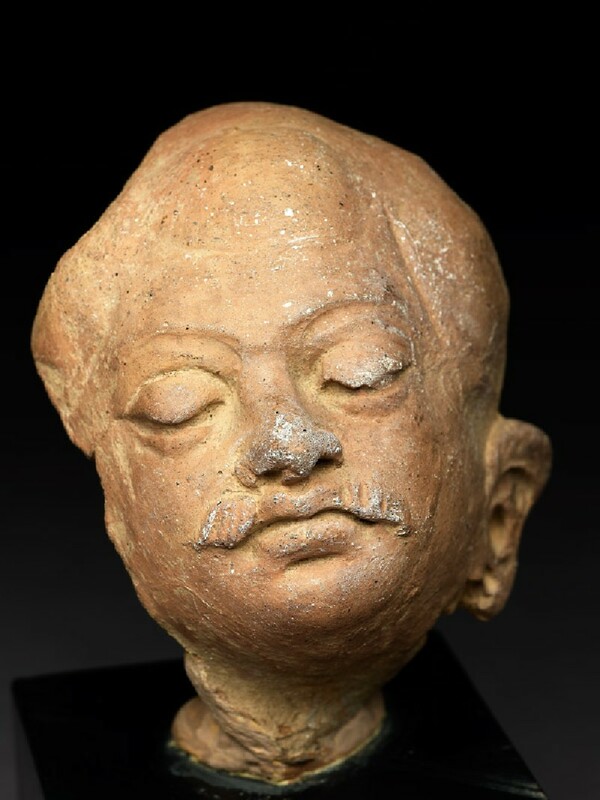 These detached heads [EAOS.50 & EAOS.50.a] almost certainly belonged to figures adorning a stūpa, in the same way as the bases of stūpas in Gandhara, where terracotta was only rarely used, were often peopled with statues in stucco [EA1970.154 and EA1958.2]. In style, with their sensitive and impressionist modelling, they are indeed very close to the late Gandhara stuccos from Haḍḍa. The relatively small numbers of early Kashmir terracottas, practically all from Akhnur, also show, along with a rather rococo sweetness, the same sharpness of characterisation which led André Malraux to see a Gothic quality in the Haḍḍa sculptures. The Ashmolean examples are particularly good examples of this feature: the rendering of apparent neurosis in the face of the man wearing a helmet, perhaps one of the soldiers in the army of Māra who sought to prevent the Buddha from achieving illumination at Bodhgaya, and of self-indulgent languor in the moustachioed head.